Why Won’t You Just Meet Me Halfway? Have you heard yourself ask this question, usually in frustration: Why won’t they just meet me halfway?! This often gets said when we are in a disagreement or a conflict with someone or another group and we want to make progress on an issue or mend a relationship. But, what do we really mean when we ask the question? First of all, what is halfway? How do you know? If you imagine a road with point A and point B and you start at one point and the person you wish to persuade to meet you halfway starts at the other point, it is pretty easy to discern the halfway point. However, what if there are other roads connecting points A and B? Do you know which road you are each traveling? In the case of a difference of views on an issue or circumstance, are you even clear on your own starting point? Have you really thought about it, clarified it for yourself or are you assuming? What about the other person (or group)? You may think you know their starting point … but do you really? 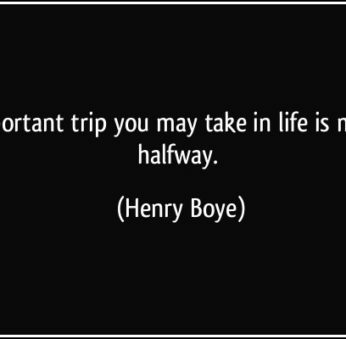 Another key question to ask yourself is, what do you mean by halfway? If there are more than one possible starting points or interpretations of starting points or if there are multiple pathways between the two, which is usually the case, then what is halfway? More often than not what we mean when we say halfway is, here’s where I am, here is the road in front of me, meet me on my road. MY road. Not THE road. Not your road. Not some other road we may not yet have discovered. Meet me halfway on my road. Which means, come to me. Compromise something that may be important to you and meet me on my path. If this trip is important, then determining starting points and the willingness to find the intersection that represents “halfway” is worth the time it takes. What steps are you willing to take to meet the other person (or group) at some other point that may or may not be the “half way” you think you are asking? What might you need to let go of or be willing to compromise to get to this point? What curiosity are you willing to bring to your own motives and to the motives of the other person? Worldview Intelligence offers the opportunity to discover your own starting point (or that of your organization or community) on issues that matter enough to involve other people. It invites you to imagine what the other person’s (or group’s) starting point might be and then allows you the opportunity to invite a conversation that may evoke a very different pathway than the one that is directly in front of you or the other person; a pathway that has greater potential to meet at the intersection of worldviews, where both or all views make an important contribution to solutions you may not have thought about or considered, each on your own. Join us in Halifax on November 30, 2017 to learn more about starting points and meeting halfway.